This sharp cartoon is from The Wizard of Id – a classic daily newspaper comic strip created by Brant Parker and Johnny Hart in 1964 to satirize modern American culture and politics. The strip deals with the goings-on of the rundown and oppressed shabby kingdom called “Id”. It mostly concentrates on the court of a tyrannical, dwarfish monarch known only as “the King” which refers to his subjects as “Idiots”. In some strips the king is elected to his monarchial position (albeit through rigged ballots). The king also run an inept army perpetually at war with “the Huns”, while the unhappy, overtaxed peasants (or Idiots) make little money as farmers and stablehands to keep modest living. PS: Jean-Jacques Rousseau said this before. This entry was posted in Oleg Komlik and tagged funny, policy, politics. Bookmark the permalink. 1 Response to Remember the Golden Rule! 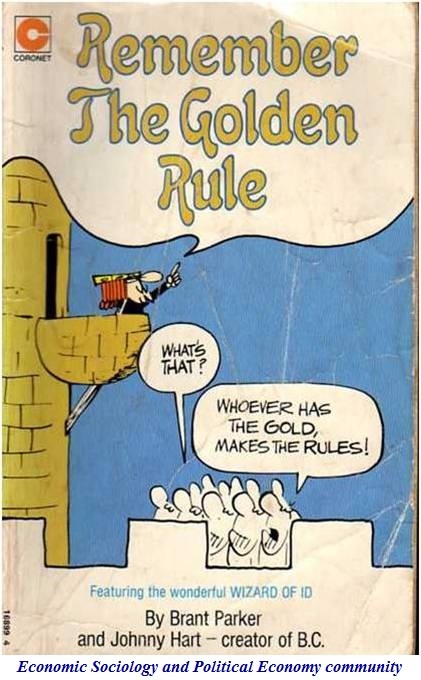 Whoever has the gold, makes the rules!